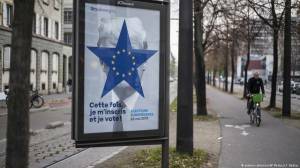 Five months ahead of the European elections in May, the EU's executive has proposed more than doubling the Commission's budget to tackle disinformation from €1.9 million ($2.1 million) to €5 million. "Disinformation is part of Russia's military doctrine and its strategy to divide and weaken the West," Andrus Ansip, the EU's vice president for the digital single market, said on Wednesday. Russia spent €1.1 billion each year on pro-Kremlin media, said Ansip, a former prime minister of Estonia. "We have seen attempts to interfere in elections and referenda, with evidence pointing to Russia as a primary source of these campaigns," he added. A "rapid alert" mechanism would warn governments to fend off developing disinformation campaigns. The Commission called on Facebook, Google, Twitter, Mozilla and advertising trade associations to "swiftly and effectively" act on disinformation by closing fake accounts and blocking messages spread automatically by bots. The Commission's justice commissioner, Vera Jourova, said the EU would pressure online giants to fulfill their commitments with "regulatory" action should they not live up to the Code of Practice they signed. "We are facing a digital arms race and Europe should not stay idle," Jourova added. Facebook has a "war room" against misinformation and manipulation by foreign actors trying to influence elections worldwide. This came in response to accusations it did too little to prevent Russian misinformation efforts during the 2016 US presidential election. The Commission's plan still has to be approved by EU leaders. If it gets the go-ahead, the system could be up and running in March.